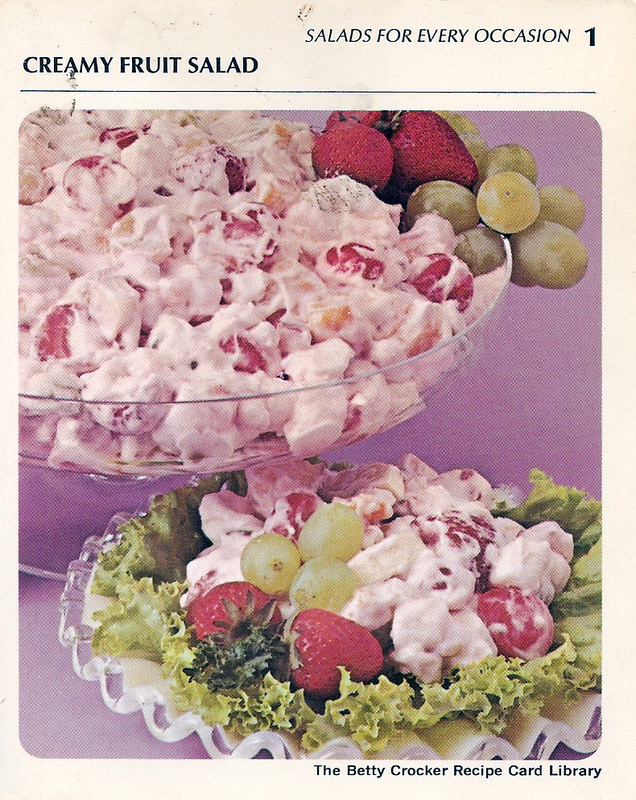 In large bowl, combine fruit cocktail, bananas, apple, grapes, cherries and marshmallows. Fold in whipped cream; refrigerate. Just before serving, garnish salad with strawberries. 4 to 6 servings. *Whipping cream can be tinted with 2 teaspoon maraschino cherry syrup or few drops food color. Serve with baked ham, buttered fresh asparagus and Toasted Party Rye: Heat oven to 325°. Spread slices of snack rye bread with soft butter or margarine; place on ungreased baking sheet. Heat 10 to 12 minutes or until crusty. ©Copyright 1971 by General Mills, Inc. All rights reserved. Printed in U.S.A.